Our English for insurance specialisation prepares insurance experts with the right vocabulary. We have been working with insurance companies ever since Pledger Business English Training started in Hamburg. That makes us experts in the specific needs of the insurance industry, which has become more and more international in commercial areas, such as marine and yacht insurance, travel, credit and aviation insurance. You may have branch offices or subsidiaries worldwide too, making it a must to improve English communications skills. 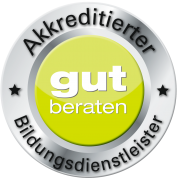 Now that it is becoming compulsory for employees of insurance companies to build up points for training, PBET has been accredited by Gut Beraten to award these points. We are proud to contribute to improving the quality and the continuing professional development of our clients. Contact us for further details.